The Queue: Fork! Me can't eat soup! The Queue: Fork! Me can’t eat soup! Much as I wanted to support my Gremlin Girl Pearl, it was hard to argue that spoons were more useful than forks once liquid meals were brought into the equation. 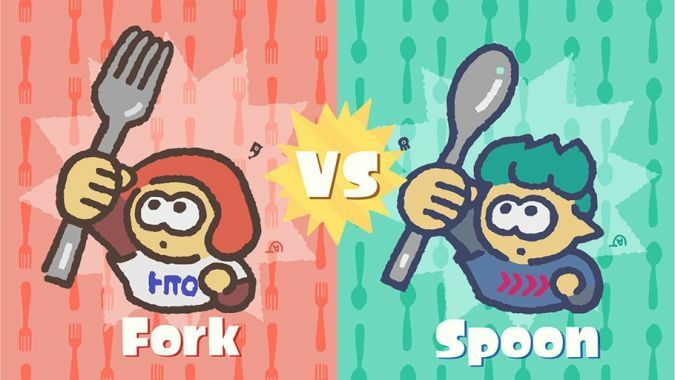 And while spoons did ultimately win the popularity contest, forks still won the overall Splatfest. They barely won, but they won all the same. Both sides won pretty close to 50% of their matches (with Forks slightly ahead), but I swear, I must have lost 75% of my matches. The Shifty Station this time around was another that helped emphasize both offense and defense, but I think I liked last month’s better. Let’s see what next month brings — and if the requirement of the Switch’s online service will change anything. But that’s the future — right now it’s The Queue(ture). Q4whoever is going to answer the Queue next: who are you? It me! Jovan! The lovable quip-meister! Q4TQ: Does Magni realize, whenever he sends us on the CoA world quests to dispatch people who are mining azerite, that once we’re done we just start mining it for ourselves for the war effort? I don’t think he does. So there was an interesting point brought up in a recent Taliesin and Evitel video that a recurring theme of the expansion so far has been council members/advisers being untrustworthy. And while Magni is the last person I’d expect to be corrupted, him having an ulterior motive would make a fitting twist within the confines of that theme. It’s something Wrathion did back in Mists, and if Magni keeping a few things hidden from us works for the Greater Good™ of Azeroth, it’s not outside the realm of possibility. Then again, maybe Magni’s role in all this is for convenience’s sake more than anything else. QfWhatever: Does anyone else find it vaguely jarring when Kul’Tirans say “Keep Calm and Carry On” at you? Yes, oh my Yogg, yes. I realize it has deeper origins than this, but all I can think of is those posters hanging up in frats and dorms and everywhere across college campuses. That’s where I first really encountered them, and it takes me out of the game whenever I hear it, even if it shouldn’t. Obviously, that’s a “me” thing, but it’s still frustrating. I wish I could erase that larger association from my mind. Q4tMitch: do mortal dreams vary in flavor, or is it just a singular melange of brain stuff? When will Spriests learn to open mage portals, Void elf quests make it apparent that’s definitely a thing they can do? Can Inklings surf through blight goo so long as their team color is green? I caught a faceless one battle pet, named it Mitch. I’m talking guildies into kneeling before it when I tank dungeons. Soon your church will eclipse the political influence of evangelicals. They vary in flavor, but none of them is correct. Every flavor is misleading. Either in 8.1 or never. I’m thinking never, because Blizzard will never love Shadow that much. You are doing fantastic work, my loyal follower. Do not abate. What I’m really asking is do the Kul Tiras Humans have a shot of being able to play as Shaman? Well, I’d put them closer to Mages, personally, but I think we have a lot of enemies in game that don’t have a 1:1 equivalence with existing playable classes. That’s part of what makes fighting them feel unique! And I don’t think Kul Tiran Humans will be able to be Shaman — but hey, maybe they will in an upcoming patch that simultaneously gives us Zandalari Prelates (i.e., Paladins). OMEDON, THERE ARE TOO MANY!!! Q4tQ: Who’s your favorite new BFA-centric NPC? Bwonsamdi counts for this question because I don’t think we’ve seen him this prominently featured before! Having done 4/6 leveling zones (Zuldazar and Voldun still to come), and the pride of Kul Tiras up to but not including SoB, my favorite is brother Pike! On top of a familiar voice taken into a really impressive new direction, I just love his take on the tidesage religion! He may be what saves the expansion for my Jaina-Loathing guildmistress, as Fenris is one of her three Dragon Age husbands! Man, I don’t know if I can pick out just one favorite. Bwonsamdi is definitely the first to pop to my mind, but Jani is excellent, Taelia is pretty much Baelia, those baby turtles made it to the water…and my heart, and Talanji is so freaking cool. Yeah, I don’t know if I can pick just one. Kudos to Blizz for pulling that off. Plain and simple: No. The game would have to be either 1) incredibly confusing to play on a controller or 2) incredibly dumbed down to be made workable with a controller. As much as Blizzard has moved in that direction over the years, there’s no way they’d take it that far. And none of that takes into account the graphical and technical hurdles that bringing WoW to consoles would have to overcome. Nor does it address the monthly subscription aspect. So, sorry to say, but I give it a 99.9999998% chance of never happening. Hey, y’all, this last one might be considered a spoiler. Skip to the comments if you don’t want very mild spoilers and some speculation alongside ’em. Does N’zoth, or any implication of old god corruption, come up in the story of Bwonsamdi? I haven’t entirely finished the stuff associated with good ol’ Bwonsamdi, but I do know that he mentions at some point “the big guy’s not gonna like this” (or something to that effect). He also mentions that he likes making deals. In other words, it’s implied that he has a boss who can, in some capacity, call the shots. And there’s a parallel between him liking deals and N’Zoth liking deals (as he mentioned in the Warbringers: Azshara short). It’s only a sliver of a possible connection, but it’s there. Given WoW’s storytelling lately, I wouldn’t be surprised to find Bwonsamdi is tied to N’Zoth somehow (though I also wouldn’t be surprised if this was all a misdirect to make us think that). That’s The Queue for today! Feel free to discuss the usefulness of spoons and forks below.